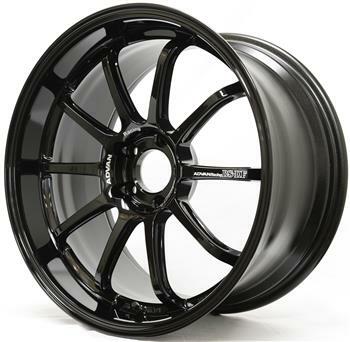 In 2012, 19-inch RS-DF one-piece form-forged wheels followed ADVAN Racing RZ-DF models came onto the market. However, because of the immense popularity of ADVAN Racing GT wheels, they lived in the shadow. Thus the development of 18-inch RS-DF Progressive aimed to match the level of the GT 18-inch model. First, they adopted the same rim form as the GT-18-inch, a racing rim profile that can accept braking systems with up to 400mm rotors. It has five choices of concave spokes, ranging from Concave-1 to Concave-5, it is the same as the GT 18-inch models. The basic 10-spoke design offers slimmer shapes than the RSII, which is also a cast wheel. The spokes are side cut on both sides using the “advanced side cut” process. These technologies were not available when the RS-DF 19-inch wheels were launched. Still, 18-inch RS-DF Progressive wheels have “ADVAN Racing” and “FORGED” machined on the center lug area. Speaking of concave spokes, they offer the same five choices as do GT wheels, and their positioning and concave degree are only slightly different from GT’s. Engineers looked closely at the GT size and their concave shape, and went after shapes that are even more appealing. So the 10-spoke design of RS-DF Progressive wheels show superior stress dispersal, giving them an advantage where weight reduction is a high priority. Making the most of that aspect, RS-DF wheels exceed GT models in both attractiveness and weight, and that’s what makes them RS-DF Progressive stand out.